Published on 22 April, 2019 in Fedora and FOSS. 0 Comments Tags: dns, fedora, pi, pi-hole, raspberry pi, tls. Quick and dirty guide to using Pi-hole with Stubby to provide both advertisement blocking and DNS over TLS. I’m using Fedora 29 ARM server edition on a Raspberry Pi 3. Download Fedora server ARM edition and write it to an SD card for the Raspberry Pi 3. Make sure your Raspberry Pi can already resolve DNS queries from some other source, such as your router or internet provider. Published on 10 March, 2019 in Fedora, FOSS and Uncategorized. 0 Comments Tags: fedora, hass, home assistant, home automation, Linux, python. Home Assistant is a really great, open source home automation platform written in Python which supports hundreds of components. They have a containerised version called Hass.io which can run on a bunch of hardware and has a built-in marketplace to make the running of addons (like Let’s Encrypt) easy. 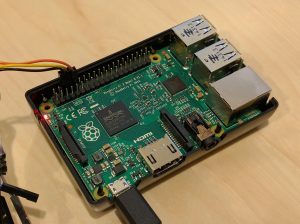 I’ve been running Home Assistant on a Raspberry Pi for a couple of years, but I want something that’s more poweful and where I have more control. Here’s how you can use the official Home Assistant containers on Fedora (note that this does not include their Hass.io marketplace). First, install Fedora Server edition, which comes with the handy web UI for managing the system called Cockpit. Once you’re up and running, install Docker and the Cockpit plugin. Now we can start and enable the Docker daemon and restart cockpit to load the Docker plugin. Korora Project is a Linux distro I created over 13 years ago, which (since 2010) takes Fedora and applies dozens of tweaks in an effort to make it more usable “out of the box” for every day users. Even with one or two others helping, it has been a lot of work so I’ve taken a break from the project for the last year to focus on other things. There has been no release of Korora since and so lately I’ve been running stock Fedora 29 Workstation (GNOME) on my laptop. I enjoy the Korora defaults though and given that my family also runs Korora, I wanted a way to be able to move them to stock Fedora while keeping the same packages as well as the look and feel. So, I created a Korora Ansible Role (it’s also on Ansible Galaxy) to apply the same Korora tweaks for stock Fedora Workstation (GNOME) plus an example playbook which uses it. I tried to make it flexible by using variables so that users can change default package lists and settings for each machine, as required. Running it on your local machine is pretty trivial, there’s a shell script with a sample inventory for localhost. Published on 28 April, 2018 in Fedora and FOSS. 13 Comments Tags: arm, fedora, nas. Hardkernel is a Korean company that makes various embedded ARM based systems, which it calls ODROID. One of their products is the ODROID-HC1, a mini NAS designed to take a single 2.5″ SATA drive (HC stands for “Home Cloud”) which comes with 2GB RAM and a Gigabit Ethernet port. There is also a 3.5″ model called the HC2. Both of these are based on the ODROID-XU4, which itself is based on the previous iteration ODROID-XU3. All of these are based on the Samsung Exynos5422 SOC and should work with the following steps. The Exynos SOC needs proprietary first stage bootloaders which are embedded in the first 1.4MB or so at the beginning of the SD card in order to load U-Boot. As these binary blobs are not re-distributable, Fedora cannot support these devices out of the box, however all the other bits are available including the kernel, device tree and U-Boot. So, we just need to piece it all together and the result is a stock Fedora system! 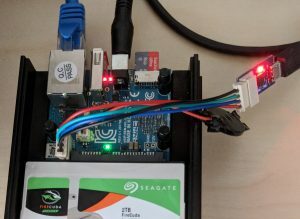 To do this you’ll need the ODROID device, a power supply (5V/4A for HC1, 12V/2A for HC2), one of their UART adapters, an SD card (UHS-I) and probably a hard drive if you want to use it as a NAS (you may also want a battery for the RTC and a case). ODROID-HC1 with UART, RTC battery, SD card and 2.5″ drive. Note that the default Fedora 27 ARM image does not support the Realtek RTL8153 Ethernet adapter out of the box (it does after a kernel upgrade) so if you don’t have a USB Ethernet dongle handy we’ll download the kernel packages on our host, save them to the SD card and install them on first boot. The Fedora 28 image works out of the box, so if you’re installing 28 you can skip that step. Published on 16 April, 2017 in Fedora, FOSS and OpenStack. 0 Comments Tags: buildroot, ironic, openstack. Edit: See this post on how to automate the builds using buildimage scripts. Ironic is an OpenStack project which provisions bare metal machines (as opposed to virtual). A tool called Ironic Python Agent (IPA) is used to control and provision these physical nodes, performing tasks such as wiping the machine and writing an image to disk. This is done by booting a custom Linux kernel and initramfs image which runs IPA and connects back to the Ironic Conductor. The Ironic project supports a couple of different image builders, including CoreOS, TinyCore and others via Disk Image Builder. These have their limitations, however, for example they require root privileges to be built and, with the exception of TinyCore, are all hundreds of megabytes in size. One of the downsides of TinyCore is limited hardware support and although it’s not used in production, it is used in the OpenStack gating tests (where it’s booted in virtual machines with ~300MB RAM). If you have a little laptop with an Intel CPU that supports turbo boost, you might find that it’s getting a little hot when you’re using it on your lap. We can see that it’s a 2.7GHz CPU with turbo boost taking it up to 3.5GHz. Here’s a way that you can enable and disable turbo boost with a systemd service, which lets you hook it into other services or disable it on boot. By default, turbo boost is on, so starting our service will disable it. Test it by running something CPU intensive and watching the current running MHz. Now disable turbo boost and check the CPU speed again. If you want to disable turbo boost on boot by default, just enable the service. As turbo boost is enabled on a Linux system by default, to turn it back on you just need to turn off the script which disables it. Published on 7 February, 2017 in Fedora, FOSS and OpenStack. 0 Comments Tags: fedora, flicker, Linux, udev, webcam. I recently got a new Dell XPS 13 (9360) laptop for work and it’s running Fedora pretty much perfectly. However, when I load up Cheese (or some other webcam program) the video from the webcam flickers. Given that I live in Australia, I had to change the powerline frequency from 60Hz to 50Hz to fix it. I wanted this to be permanent each time I turned my machine on, so I created a udev rule to handle that. Of course I also tested with a reboot. It’s easy to do with any webcam, just take a look on the USB bus for the vendor and product IDs. For example, here’s a Logitech C930e (which is probably the nicest webcam I’ve ever used, and also works perfectly under Fedora). Note that SYMLINK is not necessary, it just creates an extra /dev entry, such as /dev/c930e, which is useful if you have multiple webcams. Published on 30 January, 2017 in Fedora and OpenStack. 0 Comments Tags: development, git, openstack. I wrote a small Git hook which may be useful in helping OpenStack devs run tests (and any script they like) before a commit is made (see Superuser magazine article). This way we can save everyone time in the review process by fixing simple issues before they break in the check-pipeline. Installation is easy (see the GitHub page) and all prompts default to no, so that the dev can easily just hit Enter to skip and continue (but still be reminded). Published on 27 October, 2016 in Fedora. 35 Comments Tags: ha, home automation, Linux, raspberry pi, rpi, u-boot. My home automation setup will make use of Arduinos and also embedded Linux devices. I’m currently looking into a few boards to see if any meet my criteria. Previously I looked at the Orange Pi One, now I’m looking at the Raspberry Pi 2 (which is compatible with the 3). The most important factor for me is that the device must be supported in upstream Linux (preferably stable, but mainline will do) and U-Boot. I do not wish to use any old, crappy, vulnerable vendor trees! The Raspberry Pi needs little introduction. It’s a small ARM device, created for education, that’s taken the world by storm and is used in lots of projects. The Raspberry Pi actually has native support for booting a kernel, you don’t have to use U-Boot. However, one of the neat things about U-Boot is that it can provide netboot capabilities, so that you can boot your device from images across the network (we’re just going to use it to boot a kernel and initramfs, however). One of the other interesting things about the Raspberry Pi is that there are lots of ways to tweak the device using a config.txt file. The Raspberry Pi 3 has a 64bit CPU, however it is probably best run in 32bit mode (as a Raspberry Pi 2) as 64bit userland is not particularly advanced in ARM world, yet. Fedora 25 will finally support Raspberry Pi 2 and 3 (although not all peripherals will be supported right away). Published on 23 October, 2016 in Fedora. 10 Comments Tags: arm, ha, home automation, Linux, orange pi. My home automation setup will make use of Arduinos and also embedded Linux devices. I’m currently looking into a few boards to see if any meet my criteria. The Orange Pi One is a small, cheap ARM board based on the AllWinner H3 (sun8iw7p1) SOC with a quad-Core Cortex-A7 ARM CPU and 512MB RAM. It has no wifi, but does have an onboard 10/100 Ethernet provided by the SOC (Linux patches incoming). It has no NAND flash (not supported upstream yet anyway), but does support SD. There is lots of information available at http://linux-sunxi.org. 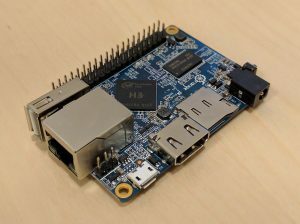 Note that while Fedora 25 does not yet support this board specifically it does support both the Orange Pi PC (which is effectively a more full-featured version of this device) and the Orange Pi Lite (which is the same but swaps Ethernet for WiFi). Using either of those configurations should at least boot on the Orange Pi One. The Just another Linux geek archives for the Fedora category.